2015 will mark the 40th anniversary of Motörhead, and the 70th birthday of Lemmy Kilmister, both of which are astonishing facts. Many metalheads, myself included, have known and liked the band even before hearing the likes of Iron Maiden – Ace of Spades is a universal cultural reference – and acceptance of their eternal existence is something we all take for granted, lucky as we are to be living in this time when the elder statesmen of metal are still alive. Aftershock, the band's twenty-first album, isn't a recognition of this amazing feat of longevity in such terms, just a kickass bunch of songs that shows the band still very much has it. Building on the solid The World Is Yours, Aftershock is longer, but doesn't feel it, the songs mostly around the three-minute mark and more than varied enough to keep your attention and avoid repetition. Really, this is Motörhead at their most solid. A strong opening with the foot-tapping Heartbreaker is followed by the equally strong Coup de Grace, before slowing the pace for Lost Woman Blues, producing an intimate groove and allowing the bluesiest aspects of Lemmy's voice to dominate, a nicely galloping finale the icing on the cake. Whether it's the blistering speed metal of End of Time, Do You Believe's Southern-tinged rocking, Death Machine's bassy rumble or Dust and Glass' depressed strum, Aftershock is interesting and enjoyable. Although we've all heard the typical rocking of Going to Mexico many times before from the band, it's still awesome, and juxtaposing it with the choppy and riff-driven Silence When You Speak to Me shows off the band's capabilities well. What is shown off best over the course of Aftershock is the band's songwriting capabilities, even late-album tracks like Crying Shame complete with its piano far from mere filler, but better than many band's single-type songs. That's partially what makes Motörhead as good as they are, quite apart from Lemmy's status as rock god extraordinaire; that level of solid quality that means you know (as I've said in reviews before) that you're going to get a good album from them even before you've heard the album. 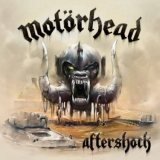 We're probably not going to get a classic album from this stage of the band's career, sadly, but a long line of solid albums is no mean feat, and Aftershock is the latest proof that Lemmy and co have still got it.